There is a common thread among potential bankruptcy clients who call seeking bankruptcy relief. They are most concerned about the cost involved in filing for bankruptcy and getting out of debt. I’m not referring to the court costs. Most potential clients are aware of the court cost because they have been asking this question over and over again among many different bankruptcy lawyers. 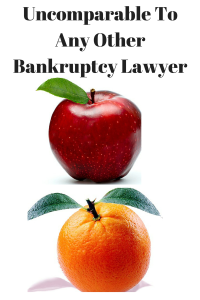 They fully understand that the filing fee for a chapter 7 bankruptcy case is $335.00 and the filing fee for a chapter 13 bankruptcy case is $310.00. What they are truly seeking is the actual attorney fee that’s going to be charged. Bankruptcy lawyers are not like a computer store or an electronics store. It is not as if you are looking for a particular computer which you can price out at Best Buy, Costco, HH Gregg, Office Depot or Staples. You are not buying a particular item which could be bought anywhere throughout the country or online. You are buying a legal service handled by humans in a multi-step process. For this reason, price should only be a small factor when you consider the variety of factors in hiring a bankruptcy attorney. Most importantly, does the attorney truly have the ability to handle your case from start to finish without incident? If not, it doesn’t matter if the service is free. You simply will not get the result that you are seeking. So how you go about finding out if the attorney you’re talking with is capable of handling your case? You can start by asking the right questions. Inquire as to how long the attorney has been practicing bankruptcy law and as to how many cases he or she handles on a yearly basis. Ask if that attorney would be willing to provide referrals of clients that they’ve helped in the past. Check online to see if there are any good reviews or negative reviews about that attorney or law firm in general. Importantly, don’t do all of your research over the telephone. You really need to get into the office to meet face-to-face with the attorney or law firm to get a sense of whether or not this is going to be the right law firm for you. Is the office clean and organized? Does the staff treat you with kindness and respect? Does the lawyer take the time to answer all of your questions and to explain the process fully? Are they just trying to get you in and out as soon as possible and make a sale? Can you get into their mindset and see their heart and see whether or not they really care about helping you? These are the items that you need to think about and you can only do that after a face-to-face visit. What you will discover is that no two bankruptcy lawyers are the same. We may utilize the same federal and state laws when filing a bankruptcy case; however, that is where the similarity ends. Every lawyer has a different way of handling cases and clients. Every lawyer has a different type of bed side manner. Every lawyer has a different level of expertise and care. If you take the time to interview two different bankruptcy lawyers at two different law firms, you will understand exactly what I’m describing. So if you’re thinking about filing for bankruptcy and you’re worried about your finances, allow me to be one of the attorneys that you interview with when making your decision. You will see that I am unlike any other bankruptcy lawyer or bankruptcy law firm in Chicago.